so said ellie: In Belgium I bought.. So I bought something Finnish in Belgium..just shuddup, ok?! 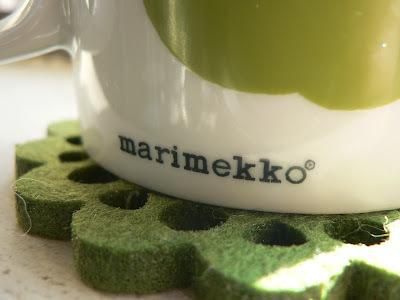 Extra points if you can guess the pattern...I do love Marimekko so, and on the pattern of things I love we should talk about those coasters some time. They're felted wool and I have two green and two navy. I bought them in Japan and I lurve them. That's like love, but better. Is it Unikko, the classical flower pattern? Seems like you enjoyed your Europe trip, with all rights! Kram!